In Alias Grace, clothing is a symbol of identity—and particularly of identity’s malleability. From a young age, Grace is keenly attuned to the way that clothes not only function as a status symbol, but also mask people’s true selves. For example, Grace points out that society at large believes that “people dressed in a certain kind of clothing are never wrong” (she is referencing the doctors who “treated” her at the asylum but also sexually abused her). Grace thus gestures at the way society wrongly associates certain kinds of clothing with authority and morality. Exchanging clothes with someone is also an important act in the novel. When the two first meet, Mary Whitney lends Grace her nightdress while Grace washes up; when Mary is buried she wears Grace’s nightdress, because hers is covered in blood. In this instance, exchanging clothes is a symbol of intimacy, but it also foreshadows Mary and Grace’s converging identities at the end of the book. Later in the novel, wearing someone else’s clothes becomes a transgressive act—indeed, almost a violent one. This is most clearly seen when Grace dons Nancy’s clothes shortly after Nancy is murdered. Grace also insists on wearing Nancy’s clothes when she is on trial, which the public interprets as a lack of remorse on Grace’s part and also as a status transgression, since Nancy’s clothes are nicer than Grace’s social class can afford. Finally, Mary Whitney takes the idea of exchanging clothing to an extreme when she claims that, upon her death, she “borrowed [Grace’s] clothing,” or her “fleshly garment.” In this way, changing “clothes” is shown to be a means not only of changing one’s social status, but also changing a person’s actual identity. The timeline below shows where the symbol Clothing appears in Alias Grace. The colored dots and icons indicate which themes are associated with that appearance. Grimm, Alexandra. "Alias Grace Symbols: Clothing." LitCharts. LitCharts LLC, 7 Feb 2018. Web. 18 Apr 2019. Grimm, Alexandra. "Alias Grace Symbols: Clothing." LitCharts LLC, February 7, 2018. 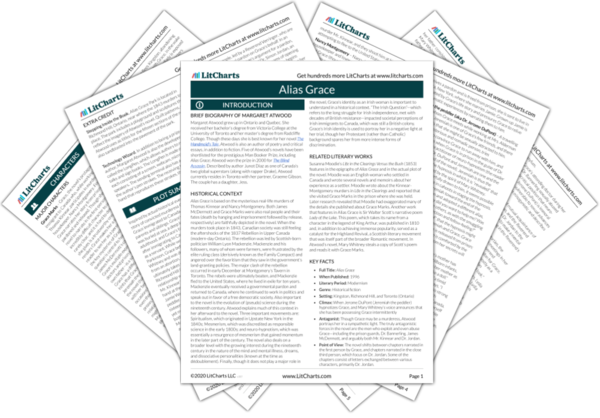 Retrieved April 18, 2019. https://www.litcharts.com/lit/alias-grace/symbols/clothing.